"Fits right in with your dream, doesn't it? Curious coincidence." You can tell a great piece of literature by how malleable it is to fit into nearly any genre. Obviously, Shakespeare's Hamlet falls into that category, and here Edgar G. Ulmer shoehorns the Bard's story into a film noir framework. Paul Cartwright (James Lydon) obsesses over the death of his father in an accident two years earlier. 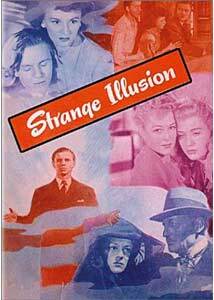 The film opens with a portentous dream that warns him of danger ahead for his mother Virginia (Sally Eilers) and sister Dorothy (Jayne Hazard) if Virginia remarries. A number of bizarre non sequiturs populate the dream as well. When Paul returns home from a fishing trip with friend Dr. Vincent (Regis Toomey), the nightmare comes true as mom is romanced by sleazy cad Brett Curtis (Warren William). Somehow, he has to make sense of the nightmare and prevent the disaster that dear dead dad seems to be hinting at. James Lydon can't carry this movie by himself. Too much a Wally Cleaver, he simply isn't leading man material. His attitude is just too gee whiz to be credible in the least. Paul's character also is somewhat lacking, with few enough details that his Oedipal fixations become positively creepy. Warren William is a standout as the slimy gigolo, but with this part it'd be hard to fail to be entertaining. Virginia and Dorothy are veritable ciphers, such that the viewer hardly cares what happens to them. The script is weak throughout, with a number of forced devices (dad not only communicates in dreams, but has letters sent periodically, having arranged them before his death). This ploy is just far too convenient to give any sensation other than head shaking. There are also some gaping holes that are left unexplained, such as why the banker is so eager to vouch for Curtis, without any real justification. This seems to be presented just to give Paul an obstacle in his quest. Not surprisingly, Ulmer, the consummate visual stylist, is able to make the picture interesting to look at throughout. His use of light and shadow is striking at many times, though the source material tends to obscure a great deal of the detail that surely must have been intended to be present. Ulmer tries valiantly to make something out of this material, but the cast, script and the print are just working too hard against him. Sadly, this is the first of All Day's Ulmer discs that can safely be passed. Image Transfer Review: The black and white picture is overly contrasty; the dark scenes, of which there are many, tend to be murky and completely impenetrable. Highlights tend to be blown out. The print is also lacking in clarity and sharpness. Speckling is very heavy at times, especially near reel changes. Not a very pleasing presentation. Audio Transfer Review: The original mono track, presented in 2.0, has some serious problems. There is crackle, noise and hiss throughout, but the most irritating aspect is a low electronic hum that is plainly audible throughout the picture. Dialogue can be followed, but I found the hum to be incredibly annoying. If it weren't for the fact I had to write a review, I would have shut the disc off before I got very far into it. Extras Review: This disc has one of the most annoying DVD menus I've ever seen. It's practically impossible to tell where the cursor is at any particular time. Trying to get to a particular feature can be utterly maddening as you instead keep going to other items on this blind menu. Outrageous. Compounding the irritation is the fact the chapter indicator and time remaining are blocked. There is a fairly good documentary about Ulmer's time at PRC studios. This Poverty Row producer of B movies was generally disregarded, but there was some talent there, such as Ulmer and Anthony Mann. The documentary seems to urge that Ulmer was involved in nearly every production by PRC, which to my mind only injures his reputation, given the immense amount of utter crap churned out by the studio. Five trailers for miscellaneous Ulmer films are presented, although oddly there is no trailer for this feature. On the disc is a gallery featuring a full set of color lobby cards, a few stills and ad materials from the pressbook. The booklet in the case contains the text portions of the pressbook, which makes for interesting reading. PRC may not have made good movies, but they were certainly intent on selling them. A marginal programmer that Ulmer unsuccessfully tries to work his magic with. The video and audio transfers leave a great deal to be desired. Worth a rental (primarily for the extras) for Ulmer fans, but otherwise this one can be avoided.